The explanation of Territory and Area Scoring is interesting, and I now think I almost understand the difference. Seki: area score diff. from terr. score? A position similar to this cropped up in one of my recent games. (Except that the game wasn't close, and was decided by resignation, so we didn't have to try to figure this out.) In this example, there are no prisoners, and White played last (both players have put down the same number of stones). Neither Black nor White can approach on the right without putting themselves in atari, so it is seki. White has an eye, and Black has an eye and a false eye... or is it really false, since White cannot approach the other end? Bill: If it were not a false eye, White would be dead. My impression is that this seki scores nothing for either player under Japanese rules (territory scoring), but that both players would get some points for the seki under Chinese rules and other using area scoring. Is this correct? Ignoring the seki, White has 49 and Black has 48 (no komi, no prisoners). Accounting for the seki, what is the score under area scoring? What is the score under territory scoring? It is clearly a seki because there is a dame that neither player wants to fill. Under territory scoring the surrounded empty points in seki are not counted. White wins by 1. SAS: You mean under Japanese rules (or Korean rules). There are other territory scoring rules (e.g., IGS rules) where points in seki do count. pfeifrot: My impression is, that under Japanese rules the marked eye counts for black making this game jigo. For this eye is surrounded completely by stones which are not in seki, since they do not possess dame. To qoute the Nihon Ki-in 1989 rules: 'Empty points surrounded by the live stones of just one player are called "eye points." Other empty points are called "dame." Stones which are alive but possess dame are said to be in "seki." Eye points surrounded by stones that are alive but not in seki are called "territory," each eye point counting as one point of territory.' But I might misinterpret what 'possess dame' means. Bill: The Japanese text is not clear on what possess dame means, but the interpretation in practice is clear, and follows tradition. Neither side gets points in this seki (or any other). Under area scoring the 3 surrounded empty points in seki are counted (2 for Black, 1 for White), and also the stones in seki (10 for Black, 10 for White). Therefore it is jigo. TakeNGive interjects -- but there are not the same number of stones in seki, right? I count 12 for Black and 10 for White. Does this mean that Black wins by 2 under area scoring? Oops, sorry. I shouldn't have subtracted the difference between stones not in seki to compare the number of stones. White stones (no dead nor captured stones): 34 (of which 10 are in seki). White's surrounded empty points: 50 (of which 1 is in seki). Black stones (no dead nor captured stones): 34 (of which 12 are in seki). 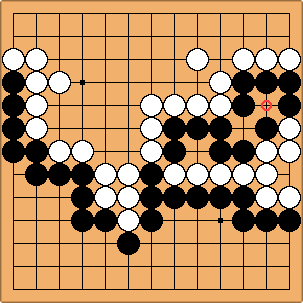 Black's surrounded empty points: 50 (of which 2 are in seki). This reminds me of a situation that I once saw where I refused a similar point and my opponent tried to claim it. After several minutes of deliberation and opinions from several other players, we wrestled for it. At least we got it right, I guess. anon: However, the important thing to remember is that counting in Chinese rules results in points for the seki. Japanese rules therefore should be consistent with Chinese rules, especially during international matches.